Yesterday saw the launch of my new website www.katiecraig.co.uk and a big thank you to everyone who commented on good it looked, all of your comments are so apprecaited. It takes a lot of effort and and many late nights (sometimes) to make things work but when they do it is worth it. 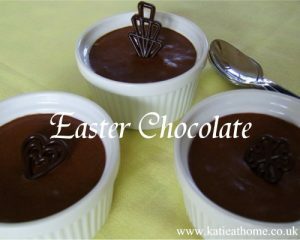 Today is another great day the sun is shining, the sky blue and I thought we would finish off the week with a recipe for Mousse au Chocolat – quick and easy to do – sorry to all of you who ave given up chocolate for Lent – perhaps this is one for the Easter table. 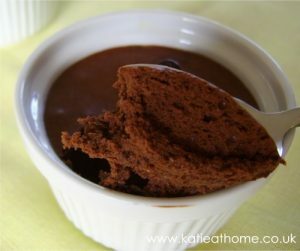 A quick and easy chocolate mousse ideal for a dinner party or tea with the children! Everybody loves it! Spoon mix into 4-6 small dishes and place in fridge until set. Warning you will find that having made this recipe once it will become a firm family favourite and the dishes you use to serve it in will become larger!! Now you could of course make this into a fantastic Easter dessert by adding a few eggs to decorate. So what are you up to this weekend? I hope the weather holds up and if so I shall be out in the garden digging and planting, I have lots more seeds to plant, but for now I am off to cover a chocolate cake in very chocolatey icing having been instructed to do so by my son, and then I need to finalise the details for our new textile range and then . . I think it might just be time for a nice cup of tea – what do you think?